The high-speed Cat ferry leaves Portland Harbor, bound for Yarmouth, Nova Scotia, in 2009. PORTLAND, Maine — The premier of Nova Scotia has committed to subsidizing a new ferry service between Yarmouth, Nova Scotia, and a Maine port, a decision that would benefit Maine and help attract additional tourism dollars to the state, several people familiar with the issue told the Bangor Daily News. Nova Scotia Premier Darrell Dexter on Friday said he would commit to finding a new operator and to providing $21 million over seven years to help subsidize ferry service across the Gulf of Maine, which was lost at the end of 2009 when Bay Ferries Ltd. shut down the service because of tough economic conditions. Dexter made the announcement after receiving the final report from an independent panel tasked with determining under what conditions a ferry service between Nova Scotia and Maine would be successful. Bay Ferries Ltd. stopped operating The Cat between Nova Scotia, Portland and Bar Harbor at the end of 2009 after the Nova Scotia government said it no longer could subsidize the service, which it was doing at the time to the tune of nearly $7 million a year. The loss of the ferry service has hurt southwestern Nova Scotia’s economy. Bringing the ferry service back, along with its resulting tourism dollars, became a political talking point in the province. The return of ferry service between Nova Scotia and Maine certainly would benefit Maine and its economy, said John Henshaw, executive director of the Maine Port Authority. At one point, the Canadian government or Bay Ferries Ltd. — Henshaw’s not sure which — was running full-page ads for the ferry service in The New York Times Sunday Magazine. “In the past the Canadians advertised heavily for the service and we benefited from that,” Henshaw said. Barbara Whitten, president of the Greater Portland Convention & Visitors Bureau, said the loss of The Cat was felt by tourism-related businesses in Portland when it left in 2009, as it brought many people to Portland who stayed overnight on either end of their trip to Nova Scotia. “It was a positive thing for Portland, a positive thing for our hotels, a positive thing all around,” Whitten said. Henshaw and Whitten don’t have firm numbers on the impact the Nova Scotia-Maine ferry service had on Maine’s economy. Charles Colgan, a professor at the Muskie School of Public Service at the University of Southern Maine, said several years ago he tried to generate interest in studying the demographics of The Cat’s passengers, which would have helped marketing efforts, but couldn’t secure the necessary funding. “When it’s up and running, no one cares, and when it’s gone, everybody wants to know about it,” Colgan said. However, renewed ferry service is far from a done deal. 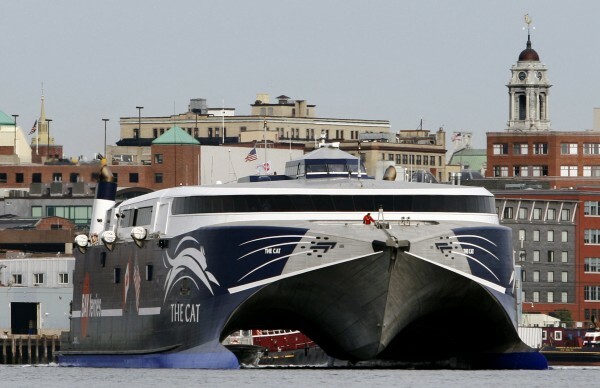 Several elements are unknown, such as whether a private sector operator could be found; whether the ferry would visit Portland, Bar Harbor or both; and whether a high-speed ferry like The Cat would be the way to go. There are also plenty of uncertainties that would affect the financial success of such a ferry service, including fuel prices and the cost of crews, but the critical uncertainty is whether a revived ferry service would be able to meet the passenger threshold needed to be commercially viable, which the panel estimates to be between 130,000 to 135,000 annual passengers. That number is higher than the roughly 75,000 passengers that boarded The Cat during its final year in service, but less than the combined 330,000 passengers that used The Cat and the Scotia Prince, the ferry that operated between Nova Scotia and Portland between 1982 to 2004, during the peak year of 2002. “There’s no shortage of challenges, but it’s a potential opportunity as well — for Maine, for Canada, for everyone,” Henshaw said. The former ferry services also served as an important transportation option for commercial freight moving from the Canadian Maritime Provinces to New England. “The commercial vehicle side of this was almost more important at times than the vacation travelers,” Colgan said. The panel’s report estimates that the provincial and federal governments would need to commit between $30 million and $35 million to get the ferry service back up and running. That includes about $13 million to refurbish the terminal facility in Nova Scotia, which is owned by the Canadian government. While the Nova Scotia and Canadian governments subsidized The Cat ferry service, Portland and Maine never did. However, Nicole Clegg, a spokeswoman for Portland, said the city could show its support in other ways. “While we can’t provide millions of dollars in subsidies, we are able to negotiate favorable lease terms for the ferry,” Clegg said, referring to the lease negotiations that would need to occur for the ferry to use Portland’s marine terminal facilities.